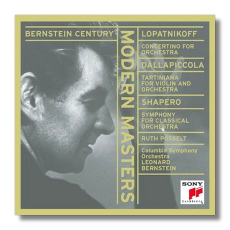 Sony's Bernstein Century series continues on, and although most of the material it includes is not new to CD, there are novelties worth taking special notice of here. Bernstein and mezzo-soprano Jennie Tourel were friends and frequent colleagues. At times, Bernstein was her piano accompanist, and at other times he was her conductor. Examples of both roles are included here. 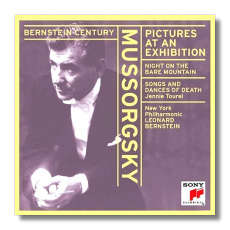 Mussorgsky's Songs and Dances of Death, recorded monaurally in 1950, finds Bernstein sitting at the piano bench, providing most able support for the singer. She herself handles the songs well. One of Tourel's strong points was characterization, and here she vividly brings death to life. (Pictures and Night on Bald Mountain may not have excited Bernstein's most interesting interpretations, but they receive more than acceptable readings in these recordings from 1958 and 1965, respectively.) Ravel's sensual and glowing Shéhérazade, recorded with orchestra at the same sessions as Songs and Dances of Death, ideally requires a singer whose voice is fresher and more lovely than Tourel's (at least at this point in her career). By placing her very much in the foreground, the original recording emphasizes the aggressive quality of her singing. 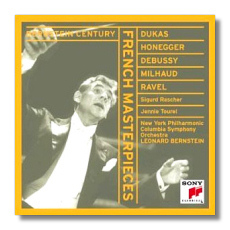 The French Masterpieces CD also contains a masterful recording, apparently new to CD, of Honegger's Pastorale d'été. The Création du monde is not advertised as new, but I have not been aware of it until now. Bernstein recorded it in 1951, and it is a good performance, although the conductor polished the music's rough edges more when he re-recorded it in France more than 20 years later. 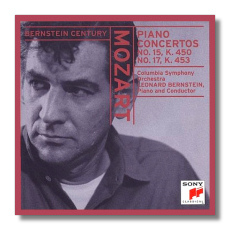 During his New York years, Bernstein's Mozart was not the E ticket that it became in the decade before his death. The two- and three-piano concertos were recorded in 1970 and 1968, respectively. Here, both are played in a hush-hush manner. Some people will find the musicianship too fey and precious; this is mincing Mozart in a big powdered wig. The pianos have been thoughtfully spread across the soundstage, allowing the listener to follow the individual parts; ain't stereo wonderful? The G-minor Piano Quartet is played in a more authentically Mozartean manner. 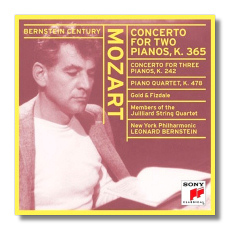 Bernstein and 75% of the Juilliard String Quartet taped it in 1965, and it's a forthright reading of Mozart's charmingly masculine work, which really is a piano concerto in disguise. Bernstein's infrequent chamber outings were satisfying glimpses into another facet of this multitalented musician. Similarly, his 1956 recordings of the 15th and 17th Piano Concertos are quite special. Bernstein conducted them from the keyboard, and he realized the humor and grace in the music without unstylish coyness. The reduced size of the Columbia Symphony Orchestra (a pick-up group largely comprised of musicians from the New York Philharmonic) was just right for these works, which date from the composer's late 20s. The last of these five CDs couples the contents of two LPs that were recorded over the course of two days in the spring of 1953. All three works have a delightful neoclassical flavor. Lopatnikoff's bustling Concertino gives many of the orchestra's musicians a chance to strut in the spotlight. The music reminds me of Hindemith at his most ingratiating. Tartiniana is composer Luigi Dallapiccola's 12-tone tribute to the 18th-century Italian master. Each of the four movements is derived from one of Tartini's violin sonatas. It is to Dallapiccola's credit that his skill prevented the dryness of the 12-tone technique from stifling his creativity, and the natural charm of the source material. Shapero's Symphony for Classical Orchestra is another strange hybrid. Composed in 1947, it uses, as the title suggests, only resources – both instrumental and compositional – that were available to Beethoven. How he uses them, however, is definitely (but not alienatingly) modern. Much more recently, American composer Michael Torke wrote several shorter orchestral works in a similar vein. Shapero's symphony, however, is in a class of its own: half Napoleonic heroism and half Frank Lloyd Wright-ish innovation. Bernstein plays the heck out of all three works. Sony claims that this is the first CD release of all three recordings, but the Shapero has been on an independent label prior to now. However, the couplings, and Sony's impressive 20-bit remasterings (used on all of the recordings in the Bernstein Century series) are a good reason to get the present release.